For those of you that missed it, Chapter 1 of this saga can be found here. We left off with the initial simulations looking peachy keen and me feeling hopeful that the hardware implementation would work. However, as these things usually go, the first time I fired the filter up nothing worked right. From Figure 1 below you can see nothing really met spec other than the response was bandpass shaped. The center frequency for a single stage was 9 MHz rather than 10 MHz, the attenuation was much less steep then expected, and where the heck did the gain go? Clearly something was wrong and I spent a few days trying to figure out what exactly that was. Going back to my simulation I started to “beat on it” as one of my professors would say. I stuck small capacitors to ground (~10 pF) on various nodes to simulate board parasitics and watched the Bode response change. Sure enough, the input nodes to the op amps were very sensitive to parasitic capacitance and I was able to reproduce the terrible response I was seeing on the spectrum analyzer. Being somewhat stupid and inexperienced I had unfortunately decided to go against the datasheet’s suggestion on page 20 to remove ground planes from beneath the amplifier. I didn’t have the option of ordering a new revision of the board so in order to fix the problem I had to get creative. 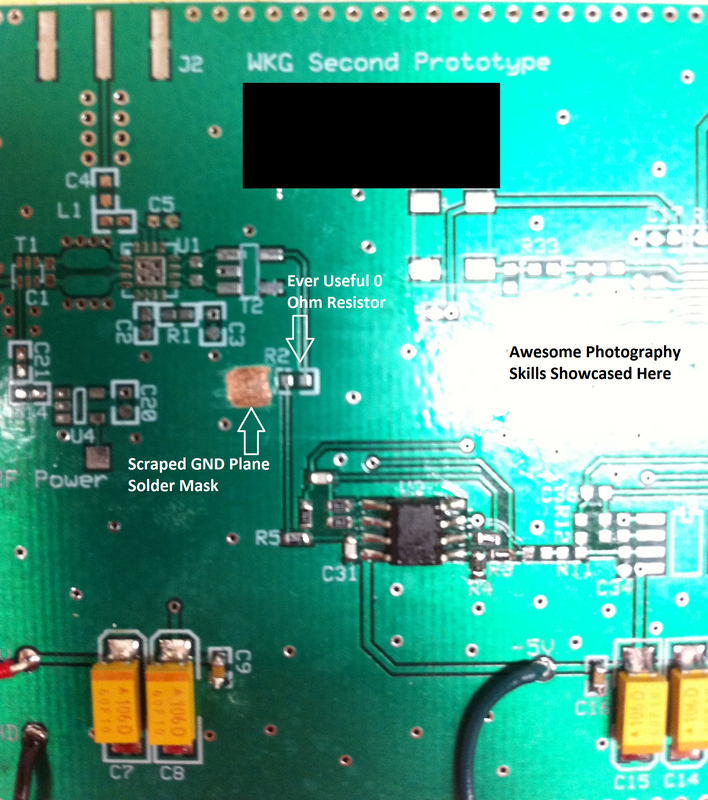 Eventually I went to ask the director of the surface mount soldering lab if he had any suggestions on the best way to partially remove my unwanted ground plane. His suggestion, mill it out by hand using the small drill press in the lab. With sweaty palms and a beating heart I carefully began to mill out the ground plane beneath each of the three filter stages on my board. Did I mention that I left the components on while do this? Well I did and the whole time I was working I was terrified that I’d drill straight through an op amp ruining the both the part and the PCB. Probably not the smartest thing I’ve ever done but after a few minutes I emerged victorious. Now to retest the filter and see if it would cooperate. Sadly, things were still pretty crappy the second time around. I forgot to grab a scope capture of the response but it was pretty similar to Figure 1 only the passband was a few dB lower than seen there. It appeared my efforts had been for naught and having exhausted all ideas I could think of I decided to hit the books to see what was really going on in my circuit. Stay tuned for the Chapter 3 for the stunning conclusion. I promise I will have it out much sooner than it took to get Chapter 2 out. 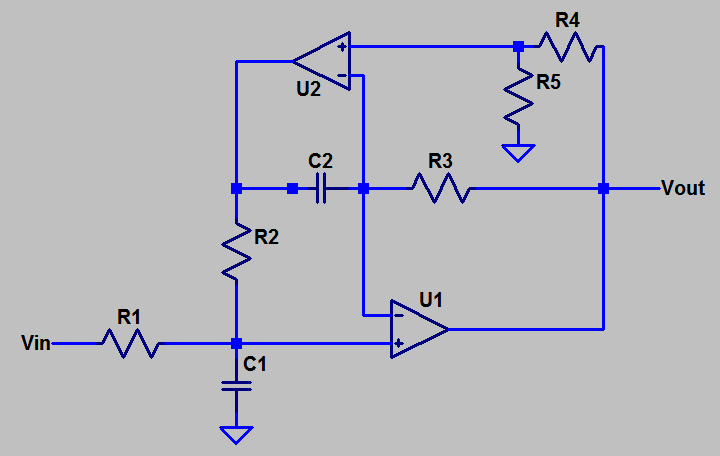 One of the circuits I have to design for my thesis is a bandpass filter. Based off the specs I was presented with back in the early fall a filter with f_center = 100 MHz and Q = 250 was required; plus f_center needed to be tunable without changing Q. Not exactly the easiest design in the world but I studied up on a few topologies and settled on the Dual Amplifier Bandpass filter (pages 5.74 and 5.93). According to Matlab and some hand calculations a 4th order filter was all I needed. Cut to Rev. 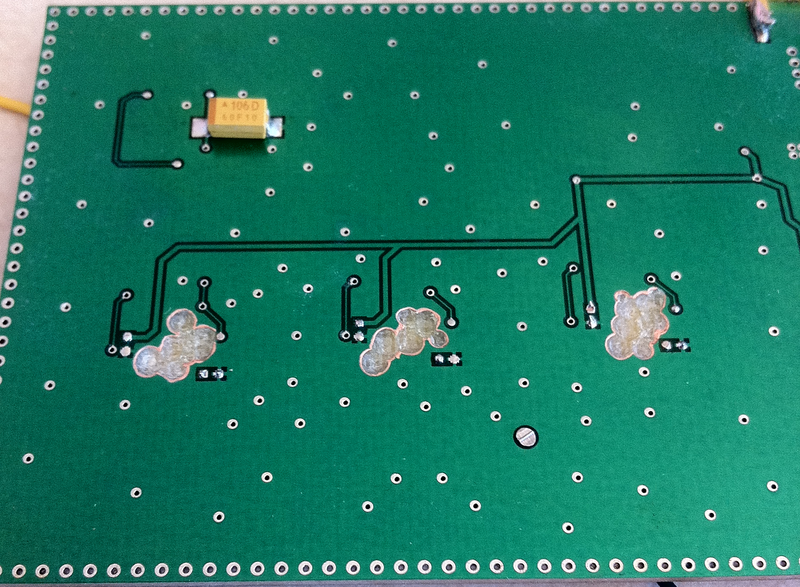 1 of the board and not a single aspect of the filter met spec or even remotely functioned as a bandpass filter. 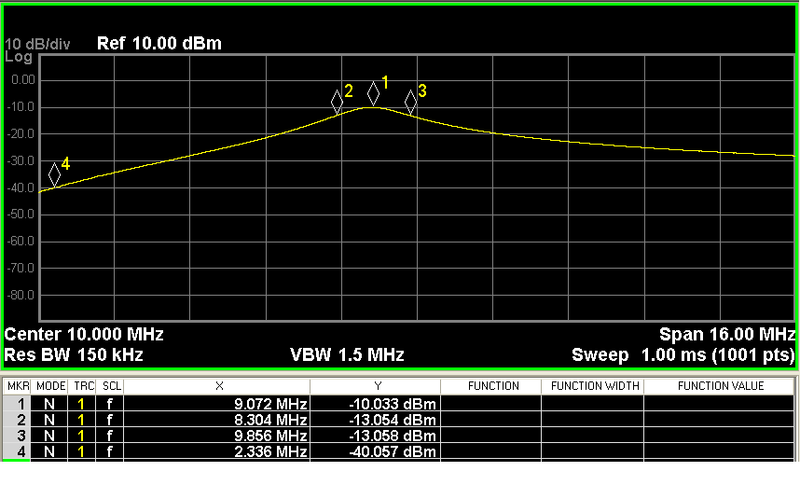 Simply scoping the output showed my design self-oscillated around 50 MHz, fantastic. Adjusting the potentiometer I put in place for R2 merely shifted the frequency of oscillation. No amount of debugging or rework could make the filter behave and according to one of my professors, my use pots in the first place was a recipe for disaster because of high parasitics along with poor overall performance at high frequencies. Another important thing to note was my use of a current feedback amplifier as opposed to a conventional voltage feedback amp because of the higher bandwidth and slew rate they offer at high frequencies (foreshadowing, this will haunt me later on…). After discussing things with my advisor we decided our first attempt was too ambitious and to spin a second revision of the board only this time with a few changes in the specs. Mercifully, having a tunable center frequency was no longer required. It was determined that this feature wasn’t necessary in the prototype stage and that designing a new tuning method would take too much effort, thus preventing me from completing more important aspects of the project. The center frequency was also dropped to 10 MHz which lowered Q down to 25 giving a much more achievable design. Refining my Matlab simulations and hand calculations showed that I was actually incorrect on my first attempt (whoops) in regards to the number of stages. With these new specs I would need a sixth order filter. I decided to keep using a current feedback amplifier though I changed parts from Rev 1 and picked the THS3202 from TI. With my first design having crashed and burned I turned to PSpice to see if I could get my design working in simulation before spending time in hardware chasing something that may prove to be a dead end. Using Intersil’s AN1613 (mentioned in my last post here) I downloaded the Spice model for the THS3202 from TI’s website, incorporated it into my schematic and began simulating. I eventually got my filter working and meeting spec with the help of some compensation techniques from other app notes I discovered and got the results below in Figures 2 and 3. While working on my thesis I often have to measure signals up into 2.45 GHz range be it testing a mixer or determining the transfer function of a filter. At such high frequencies standard banana jack or alligator clip cables turn into antennas which render any measurements done with them pretty much useless. I get around this inconvenience by using what the engineers I worked with last summer called “Poor Man’s RF Probes.” These probes are very easy to use and you can make a pair of your own for $10 assuming you already have shielded BNC to SMA cables and a few SMA billets. Semi-rigid SMA male to male cables are used to make the probes themselves; here’s a link to the ones that I’m using. There may be cheaper cables out there and if you can find them I’d love to hear about it but in order to make the probes the outer jacket needs to be exposed in order to solder it directly to ground. To make the probes themselves first cut the semi-rigid cable just below each SMA jack leaving a small amount of shielded cable to strip. Figure 1 below shows two of the probes I am using at the moment next to an uncut cable and a Digi-Key label for reference. Each probe is just over an inch long or so giving me enough room to strip the ends and bend the probe as needed while still keeping the overall length short enough to ensure quality measurements. When stripping the cut cable, I’ve found the easiest way to strip the rigid outer jacket is to use needle nose pliers. Gripping the end of the jacket with the tip of the pliers and slowly bending it back and forth a few times is usually enough to cause the jacket to break all the way around the cable and you can then just slip it off leaving the center conductor insulator exposed. The center conductor insulator can be stripped using standard wire strippers (~ 20 Gauge). 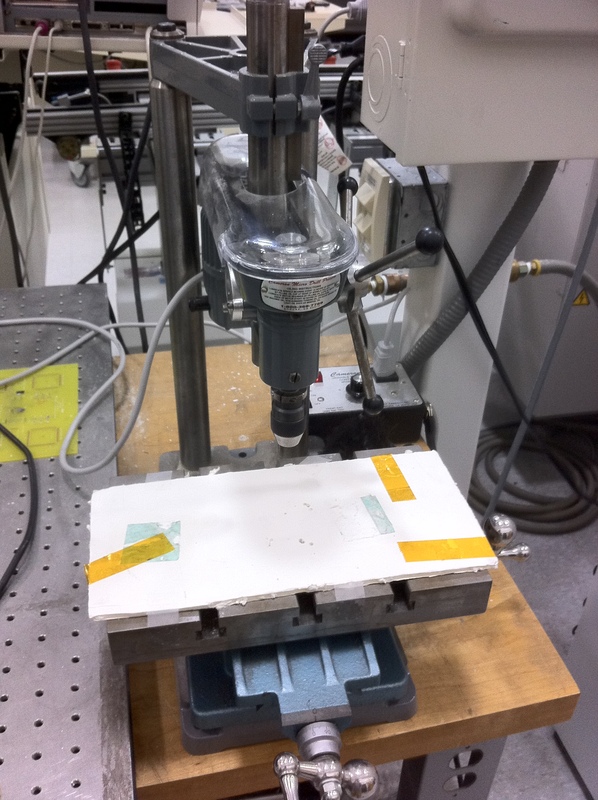 The goal is to minimize the amount of exposed center conductor keeping the probe close to the measurement point. I recommend practicing on the unusable middle portion of the cable that will be left over to get the hang of it before stripping the probes themselves. Once you get the probes themselves made, figure out where you’re actually placing the probes on your board next. Look for a relatively open area of ground plane close to the pad where you will be measuring from. Bending the stripped probe slightly is necessary for both a good ground connection and the probe’s mechanical stability. Note: It’s possible to snap the center conductor from too much bending resulting in a useless probe that will only cause headaches later on so bend with care. Once you’ve determined where you are going to solder down the probe, use a hobby knife or similar tool and carefully scrape away the solder mask on the ground plane near the measurement site. Be gentle but firm when scrapping because gouging the board too deeply could short the ground plane to any internal layers that might be in your board. 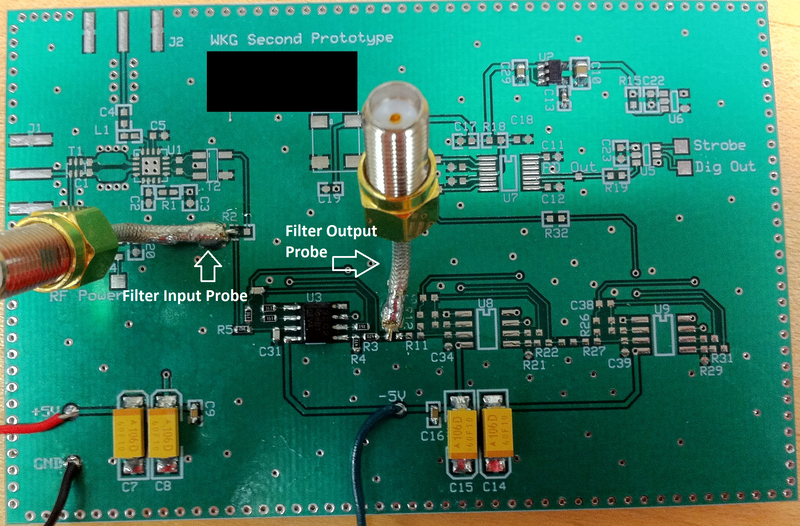 Figure 2 shows what the site around the input to my filter where I’m placing the probe. In the picture, I’m placing the conductor of the probe on the unpopulated pad of R2 making use of the 0Ω resistor trick. The third step of the process is to solder down the center conductor of the stripped SMA cable. 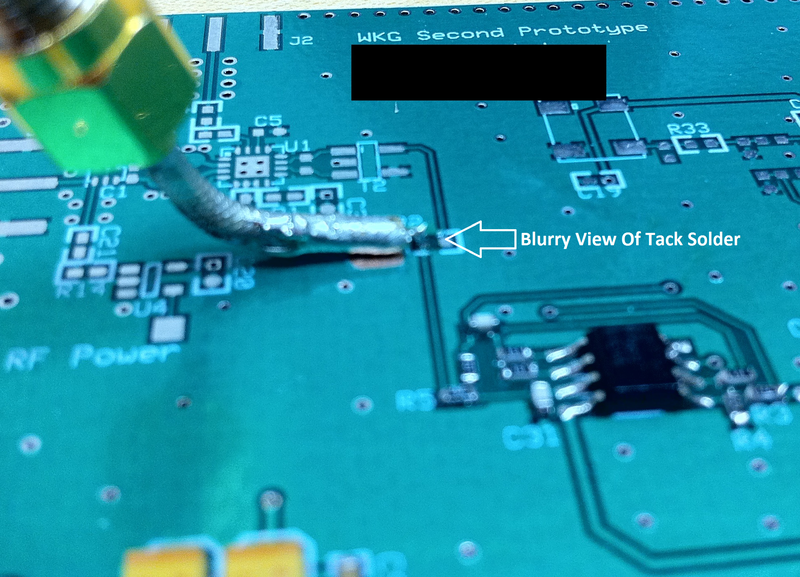 Usually I’ll tin the pad with a little solder before placing the probe, blob some solder on the iron and while holding the probe in my fingers, tack solder the center pin down (Figure 3). Note: The probe should be able to stand on its own right now but I wouldn’t move the board or probe too much as you could lift the pad the center conductor is soldered down to. The next to last step is to solder the exposed ground plane to the outer metal jacket of the probe for a solid ground connection. This will also make the probe mechanically sound so you can now make sure the center conductor is properly soldered down without worry. Note: This step can be done before the previous step if you so choose. Just don’t be like me and hold the probe with your fingers because if you’re not quick you get burned. I find this method easier as it make shorting the center conductor to ground less likely. Finally before you can consider yourself done, use a multi-meter and make a quick continuity check. Be sure the center conductor is not shorted to ground and that it is actually connecting to the node you would like it to. 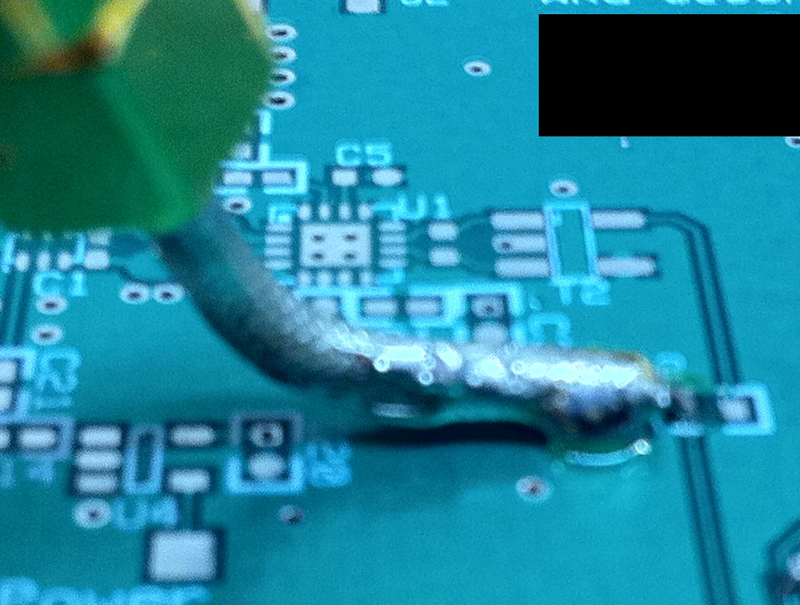 Note: If you have to desolder the probe because of a short or to remove it altogether desolder the center conductor first to avoid lifting the pad. 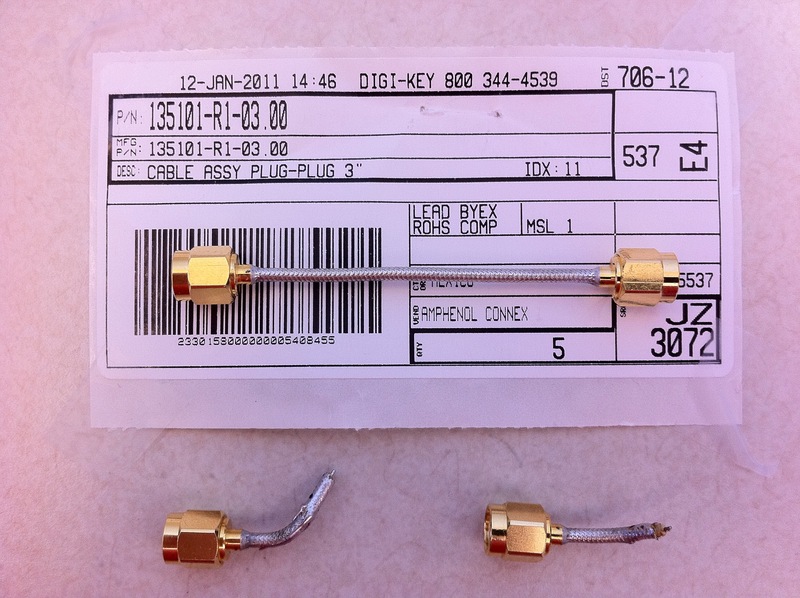 If you treat these probes with a little care they should last you long enough to justify their cost. After enough wear and tear though they will become unusable and have to be replaced. I’ve been using the same two probes for over six months now with no lose in measurement quality and they’ve been removed and resoldered quite a few times. Before each use however, I do recommend checking the continuity of the center conductor just to be sure it’s still good. Troubleshooting a bad probe isn’t exactly fun and can make you lose your hair when your circuit mysteriously stops working.